Bowl - Used to hold the tobacco. This will be covered by foil paper or a heat management device (HMD). Get more information on HMD’s here. Tray - The hookah tray holds unused coals and collects ash from coals that are being used. Shaft - This is a pipe that connects the base and the bowl. This is the main piece of any hookah. Hose Port - This is where the hose will go and smoke will exit here. Release Valve - Used as a channel to release harsh, stagnant smoke by blowing into it. Downstem - An extension to the shaft, this part is partially submerged into water. Glass Base - The glass base is filled with water and it is used as a filter for the smoke. 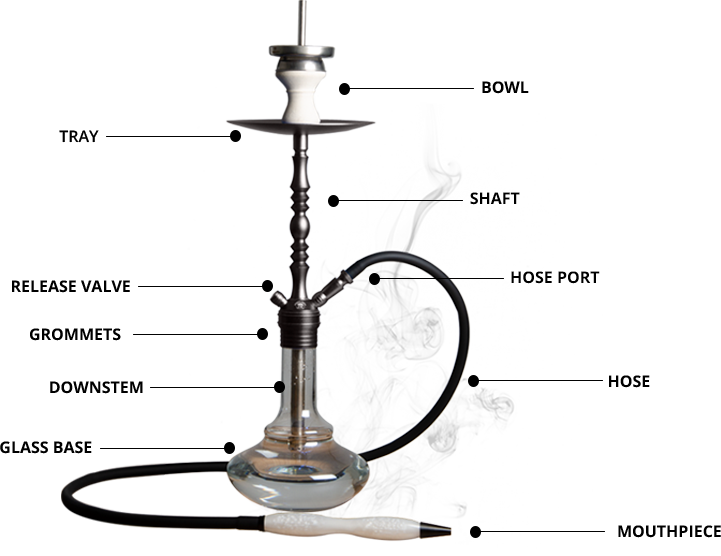 Hose - When connected to the hose port, it’s what’s used to smoke the shisha. Mouthpiece - This part is what he/she uses to smoke from the hookah. Grommets - Made from rubber or plastic materials used to connect parts of the hookah. Fill the glass base with water and ice cubes. Ice provides thicker clouds and a more enjoyable smoke session. The down stem must be submerged about an inch (38mm) under water. Place the shorter end of the hose into the hose port. This will be what transports the smoke from the hookah to you. Fill the bowl with your Eternal Smoke shisha. For help with packing your bowl read our guide here. Place the shisha packed bowl on the hookah. Make sure it is securely placed on there. Add foil paper to the bowl and create small holes. Use a push pin for the perfect size hole. Using tongs, light a corner of the coal. Set the coal on the foil paper and let it heat for 5 minutes. Grab the hose and enjoy! Let us know how your first smoke session went!